We have developed this project Clinic Management System on PHP and MySQL. Our website Freeprojectz.com contains free download php projects including fully working source code and database. There is single user admin. Admin can manage doctor, appointments, timeslot, calnder, patients etc. Here students can get php projects with source code and database free download. 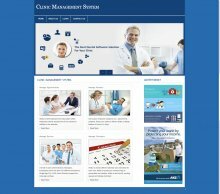 This project Clinic Management System has been developed on PHP and MySQL Platform. Here students can get easily php projects free download with source code. Student can find all the easy simple php mysql project with source code and database download. The main objective for developing this project was to automate the opertaions of the Clinic. There are lots of operations and functionality done in clinic system, so I developed this project to automate all the functionality and maintain the data accuracy. The main aim of this Clinic Management System Project in PHP is to manage the details of Patient, Medicines, Doctors, Tests, Treatments. It manages all the information about Patient, Reports, Treatments, Patient. The purpose of this system is to build an application program to reduce the manual work for keep to track of patient information and managing the Patient, Medicines, Reports, Doctors. It tracks all the details about the Doctors, Tests, Treatments. This system provides the searching facilities based on various factors like Patient, Doctors, Tests, Treatments. Students can select php topics for final year students topic from given php project titles list and easily download php projects for beginners. This project shows the information and description of the patient diseases.